The recent trip is not as monumental as some are making it out to be. Agreements from the meeting instead advanced a budding but still largely symbolic ‘comprehensive partnership’ launched in 2013. According to a White House statement, the two leaders achieved concrete agreements on double taxation avoidance, cooperation on pandemic threats, aviation safety and education. They also committed to cooperate on various regional and global issues, including natural disasters, wildlife trafficking and water security, and work towards concluding the Trans-Pacific Partnership preferential trade pact as soon as possible. The defense agreements announced during Trong’s visit will not significantly bolster Vietnam’s power projection or deterrent capabilities amid intensifying maritime territorial disputes with China. Chinese island-building in the South China Sea, if developed into military bases with air strips, represent a clear and present threat to Vietnam’s strategic position. In a provocatively timed move, China redeployed in late June its Haiyang Shiyou 981 oil exploration rig in waters claimed by Beijing and Hanoi. A similar deployment of the rig last year led to clashes at sea and lethal anti-China riots in Vietnam. Hanoi is believed to covet U.S.-made P-3 Orion surveillance planes, aerial drones and gun-equipped high speed patrol vessels to counter China – all of which are still banned from sale under the current arms embargo. A recent Reuters report quoting “industry sources” claimed Vietnam was in discussions with the defense wings of Sweden’s Saab, European multinational Airbus, and the U.S.’s Boeing to purchase jets, patrol planes and unarmed drones. Trong viewed a Boeing 787 Dreamliner commercial aircraft to be delivered to Vietnam during his Washington tour; Airbus recently announced plans to establish manufacturing plants in Vietnam. Maintenance of the embargo is partly a response to Hanoi’s still abysmal rights record. Human Rights Watch, a U.S.-based advocacy group, says there are at least 150 political prisoners now held behind bars. Many of those activists were sentenced on anti-state charges for protesting against China’s perceived encroachment on Vietnamese territory or exploitative business practices. Obama told reporters he had “candid” discussions with Trong on human rights issues, but there was no sign of a breakthrough. For years, the two sides have regularly engaged in a largely ineffectual human rights dialogue. 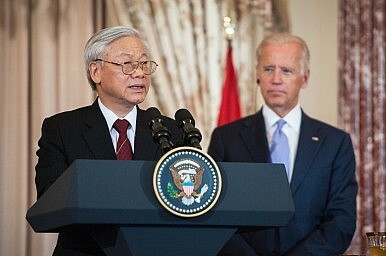 Vietnamese officials have consistently claimed they hold no prisoners of conscience. Certain reports portrayed U.S.-trained human rights lawyer Le Quoc Quan’s release from prison in late June as a nod to Washington’s concerns, but the activist had already served his full 30-month sentence. Last October’s early release from prison of prominent blogger and anti-China activist Nguyen Van Hai, known as Dieu Cay, was viewed by some analysts as a quid pro quo exchange for access to U.S. maritime patrol vessels. Obama had publicly called for the independent blogger’s freedom and hosted him at the White House after his release and flight to exile in the U.S. Nor did the Obama-Trong meet advance the U.S.’s call for preferential access to Vietnam’s deep-sea port at Cam Ranh Bay. Reuters reported in March that Washington requested Hanoi to stop Russia from using the strategically important base after Russian bombers used it to refuel while circling an American air base on the Pacific island of Guam. Consistent with its “three no’s” policy against foreign alliances, bases or reliance, widely viewed as a sop to China, Vietnam has declined repeated U.S. requests for exclusive foreign rights to the facilities, according to reports. With the U.S. embargo still firmly in place, Vietnam will continue to rely on Cold War era ally Russia for its deterrent defenses. The week before Trong’s visit to Washington, Hanoi took delivery at Cam Ranh Bay of a fourth Russian-built, missile-enabled, advanced Kilo-class submarine designed for anti-submarine and anti-surface ship warfare. Vietnam will operate six of the diesel-electric submarines by the end of this year, giving it Southeast Asia’s most advanced fleet. While Vietnam may aspire to upgrade from Russian to U.S. gear, Trong’s symbolic visit highlighted the still high hurdles blocking a fully fledged strategic relationship. General Secretary urges both sides to advance their relationship in a major policy speech.